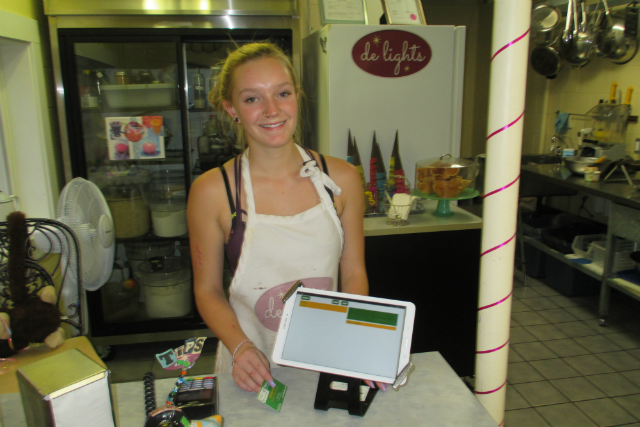 de lights gelato shop in Kimberley uses POS-n-go to ring in sales and clock employee time. Summer means cool treats. At de lights enjoy Itallian gelato and dairy free sorbetto, as well as, cookies, smoothies, coffee and iced tea. Noelle Duncan works behind the counter to help you make a tough gelato decision. Her reaction to POS-n-go, "I absolutely love it, easy to use, super efficient and fast." Duncan has worked in other places using different POS systems. She said POS-n-go is by far the best one. "They're pretty incomparable to this [POS-n-go], they're not as quick and being able to customize makes a huge difference." On the corner at Wallinger next to the Post Office. Open late and every weekend in September when you get the urge to indulge. Make your summer de lights!